Last summer, my husband and I purchased a 60+ year old home from a darling 80+ year old woman. The home had become too much for her to take care of and she decided she would prefer to be in an assisted living community so the house sat empty for about a year. And during that time, when no one was living in the home, it deteriorated faster than when she was there doing her best to keep up with it. So by the time we bought the house, it was in need of some serious TLC. We took it back to the studs, built an addition, new HVAC, new plumbing, new electric. We did manage to keep and restore the hardwood floors in the original part of the home. And now the home has been restored and has new life. When we’re not actively engaged in the marriage on a daily basis, it can deteriorate much faster than when we are engaged in it, even when it’s struggling. If you’re actively engaged in the struggle, at least you’re still trying. Alternatively, when you shut down and disengage from your marriage, when you become indifferent to your partner and ignore your desires for a deeper connection, the marriage is going to suffer. Just like a home that’s not lived in, it will weaken at a faster rate when there’s no one actively looking after it or engaged in it. I know it feels easier to sit back and hope that things will magically get better than it is to dive in, roll-up your sleeves and do the work to see if the disconnected marriage can feel good again. I know it feels safer to not ask the pressing questions of one another because the answers may lead you to understanding that the marriage cannot be salvaged and it’s time to lovingly release it so that you can both move on. 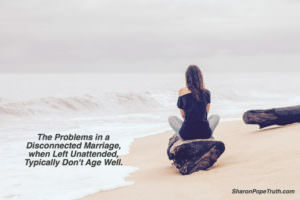 The problems in our marriages, when left unattended, typically don’t age well. It’s been my experience that the longer we leave the problems unresolved, the worse it feels and the more resentment is built. You can’t change something that you’re not willing to look at. And you can’t learn from something you ignore. You can’t get to the answers if you never ask the questions.